Make compassion the cotton, contentment the thread, modesty the knot and truth the twist. 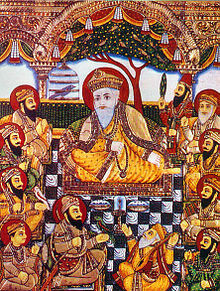 Guru Nanak (April 15, 1469 – September 22, 1539) also addressed as Baba Nanak or Nanak Shah founded the religion of Sikhism. He was the first of the ten Sikh Gurus, while the Guru Granth Sahib is considered as the eleventh guru. He travelled widely through out the country propagating the message of one God who dwells in every one of God's creations and constitutes the eternal Truth. His birth is celebrated world-wide on Kartik Puranmashi, the full-moon day which falls on different dates each year in the month of Kartik, October–November. Gurdwara Janam Asthan, birth place of Guru Nanak. The impurity of the mind is greed, and the impurity of the tongue is falsehood. The impurity of the eyes is to gaze upon the beauty of another man's wife, and his wealth. The impurity of the ears is to listen to the slander of others. O Nanak, the mortal's soul goes, bound and gagged to the city of Death. All impurity comes from doubt and attachment to duality. Birth and death are subject to the Command of the Lord's Will; through His Will we come and go. This is the sacred thread of the soul; if you have it, then go ahead and put it on me. Through a woman are established social ties. When from woman are born leaders and rulers. Without woman there can be no human birth. Without woman, O Nanak, only the True One exists. They appear with a radiant face. You shall everywhere mind the book of the Granth-Sahib as your Guru; whatever you shall ask it will show you. There is no Hindu, nor any Mussalman. This was his first statement after his enlightenment as quoted in Journal of Sikh Studies, Vol. 7, 1-2 (February - August 1980), p. 39; also in "Guru Nanak Dev ji (1469 - 1539)"
Guru Nanak Dev ji (1469 - 1539). Sikh History.com. Retrieved on 14 December 2013. If Ganges water will reach your ancestors in heaven, why should the water I throw up not reach my fields in the Punjab, which are far less distant ? O Lallo, as the words of the Lord come to me, so do I express them. The sun and moon, O Lord, are Thy lamps; the firmament Thy salver; the orbs of the stars the pearls encased in it. Thou hast a thousand stainless feet and yet not one foot; Thou hast a thousand organs of smell and yet not one organ. I am fascinated by this play of 'l hine. By the Guru's teaching the light becometh manifest. Give the water of Thy favour to the Sarang (bird) Nanak, so that he may dwell in Thy Name. Guru Nanak quotes. Goodreads. Retrieved on 14 December 2014.
write that which has no end or limit. those who have loved are those that have found God. I am neither male nor female, nor am I sexless. I am the Peaceful One, whose form is self-effulgent, powerful radiance. There is but One God, His name is Truth, He is the Creator, He fears none, he is without hate, He never dies, He is beyond the cycle of births and death, He is self illuminated, He is realized by the kindness of the True Guru. He was True in the beginning, He was True when the ages commenced and has ever been True, He is also True now. There is but one God. True is His Name, creative His personality and immortal His form. He is without fear sans enmity, unborn and self-illumined. By the Guru's grace He is obtained. Nanak, the whole world is in distress. He, who believes in the Name, becomes victorious. Some hymns sung in specific raaga|ragas cited in Life Of Guru Nanak: Chapter I. Sacred Texts.com. The one Lord who created the world is the Lord of all. Fortunate is their advent into the world, whose hearts remain attached to God's service. O foolish man, why hast thou forgotten Him? When thou adjustest thine account, my friend, thou shalt be deemed educated. The Primal Being is the Giver; He alone is true. No account shall be due by the pious man who understandeth by means of these letters. Praise Him whose limit cannot be found. They who practise truth and perform service shall obtain their reward. He who knoweth divine knowledge is the learned pandit. He who knoweth the one God in all creatures would never say 'I exist by myself '. When the hair groweth white, it shineth without soap. King Death's hunters follow him who is bound by the chain of mammon. The Creator, Lord of the world, giveth sustenance to His slaves. All the world is bound in His bonds; no other authority prevaileth. He who hath renounced the singing of God's word, is arrogant in his language. He who fashioned vessels made kilns in which He put them and burnt them. Who deemeth bad and good as the same, shall in this way be absorbed in Him. Hath been in every age a Jogi, a worldly man, or a learned pandit. Nanak's religion consisted in the love of God, love of man and love of godly living. His religion was above the limits of caste, creed and country. He gave his love to all, Hindus, Muslims, Indians and foreigners alike. His religion was a people's movement based on modern conceptions of secularism and socialism, a common brotherhood of all human beings. Like Rousseau, Nanak felt 250 years earlier that it was the common people who made up the human race. They had always toiled and tussled for princes, priests and politicians. What did not concern the common people was hardly worth considering. Nanak's work to begin with assumed the form of an agrarian movement. His teachings were purely in Punjabi language mostly spoken by cultivators. He appealed to the downtrodden and the oppressed peasants and petty traders as they were ground down between the two mill stones of Government tyranny and the new Muslims' brutality. Nanak's faith was simple and sublime. It was the life lived. His religion was not a system of philosophy like Hinduism. It was a discipline, a way of life, a force, which connected one Sikh with another as well as with the Guru. Dr H.R. Gupta, the well-known historian in "Guru Nanak Dev ji (1469 - 1539)". In Nanak's time Indian society was based on caste and was divided into countless watertight Compartments. Men were considered high and low on account of their birth and not according to their deeds. Equality of human beings was a dream. There was no spirit of national unity except feelings of community fellowship. In Nanak's views men's love of God was the criterion to judge whether a person was good or bad, high or low. As the caste system was not based on divine love, he condemned it. Nanak aimed at creating a casteless and classless society similar to the modern type of socialist society in which all were equal and where one member did not exploit the other. Nanak insisted that every Sikh house should serve as a place of love and devotion, a true guest house (Sach dharamshala). Every Sikh was enjoined to welcome a traveller or a needy person and to share his meals and other comforts with him. "Guru Nanak aimed at uplifting the individual as well as building a nation. Shri Babaji shows us the practical side of the teachings of great saints like Guru Nanak, who did not preach a particular religion or cult. He gave teachings of spiritual perfection, valid for all mankind. To follow these teachings is to realize good for all humanity and the unity of all humanity and the unity of the individual soul with the universal Soul. Shri Shastriji about Haidakhan Babaji, cited in: The Teachings of Babaji, 10 April 1983. Max Arthur MacAuliff, The Sikh Religion, Vol 1, (The Life of Guru Nanak Dev Ji), Oxford University Press, 1909. This page was last edited on 17 October 2017, at 23:53.